Daughter of a physician. From 1932 onwards she was engaged at the Thalia Theater in Hamburg, where her husband Willy Maertens worked since 1927. She was of Jewish decent and in 1935 she was forbidden to work. She escaped death after the president of the Reichstheaterkammer falsely declared that she had already proven that she was an Arian. After the war she managed to continue her career succesfully. She worked for the Thalia Theater until her death. During the 1960s she occasionaly worked for television as well. Her son Peter Maertens also became an actor. 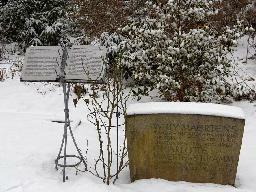 The tombstone of Willy Maertens and Charlotte Maertens-Kramm in the 'Garten der Frauen' at the Ohlsdorfer Friedhof in Hamburg.